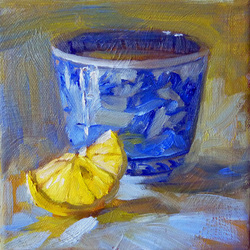 Janet Wilson is currently following the discipline of 'daily painting'. Almost every day, she produces a painting ‘alla prima’, which means “at the first’ or done in one sitting. This kind of direct, “wet on wet” oil painting gives a loose and spontaneous look. She tries to keep the painting as fresh as the flowers or fruits or vegetables that she is inspired to capture on canvas. They are 6" x 6" or 5" x 7", and sell for $125.